Why Should You Try Mochi Ice Cream? 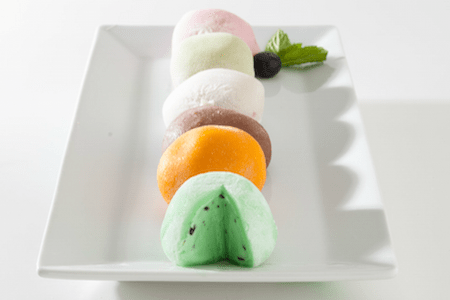 Whether you’ve had Mochi Ice Cream before and love it, or are interested in trying it for the first time, here are 7 reasons why you need Mochi Ice Cream in your life. You haven’t experienced dessert until you’ve tried the unique flavors and texture of Mochi Ice Cream. If you’re a foodie then you love experiencing and tasting exciting new dishes and desserts. If you’re looking for the next big thing, you’ve come to the right spot. Mochi is revolutionizing the way we eat dessert and you can be the first of your friends to know about it. Mochi Ice Cream is the best treat to serve at parties or events because they are delicious and convenient. Not only do they come in a variety of flavors so that your guests can discover their favorites, but they are also the perfect serving size! With the solid outer layer of rice-flour Mochi dough, they are easy to grab and carry around. And an additional bonus: you don’t have to worry about cleaning up bowls and spoons afterward! We understand that some days can be overwhelming. When you’re having a rough day one of the best ways to brighten your mood and lift your spirit is escaping into the colorful world of Mochi. Taking a bite into Mochi Ice Cream is like biting into happiness. So when you’re feeling down, sink your teeth into the comforting, delightful flavors of Mochi for a quick pick-me-up. Getting bored of your usual snacks? Mochi Ice Cream is not just a dessert, but also a great snack! With the outer rice flour dough, it doesn’t just feel like you’re eating ice cream; rather having a treat with a little more sustenance. It is also fun and easy to eat, whether you are relaxing at home or on the go. Everyone knows a good movie night isn’t complete without a tasty snack! While popcorn is a classic movie treat, sometimes you just need something sweet and flavorful. Mix and match Mochi flavors like chocolate and green tea, mango and strawberry, cookies and cream and black sesame, or otherwise. There are numerous flavors to choose from! Share the fun of eating Mochi with your friends and family while enjoying your movie experience. Looking for a simple, but tasty treat for your office gathering? Mochi Ice Cream is perfect for any type of event. You can even serve them on platter, cut in half like tapas to really surprise and delight your employees. Want to be the hero when you come home from work? Try bringing home a box or two of Mochi Ice Cream. This is a sure way to make your kids or significant other happy. When you want to unwind from your day and your kids want a delicious treat, Mochi Ice Cream does the trick.